While the shift from disk to digital offers tremendous potential opportunities, it also presents a host of new challenges for gaming companies. As the online channel grows increasingly complex and the pace of innovation accelerates, many companies struggle to keep up. Not only are there websites and storefronts to manage, but also real-time gaming servers, large software downloads, and live-streamed competitions and events. Games are transforming from fixed, boxed products to dynamic, ongoing services – with frequently updated content, in-game micro-transactions, virtual goods and social interactions. Mobile adds another dimension to the trend, as consumers increasingly look to play on smart phones and tablets – or on multiple screens across devices. 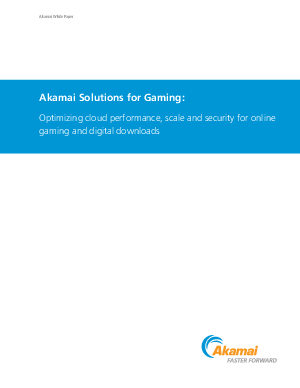 To successfully navigate this complex and changing landscape, gaming companies need an agile, high- performance infrastructure that allows them to turn the Internet into a reliable and effective online distribution channel. This requires focusing on three key areas, each with its own set of challenges: the user experience, delivering at scale and online channel security.